the globe as the leader in not-so-traditional rudimental drumming. Pratt, Earl Sturtze and so many more, Dominick has built a reputation as one of the "good guys" in the world of drumming. Known by many of his fans as the fife & drum guy, his knowledge as a teacher, musicality as a composer, power as a drummer and entertainment as a clinician, all sit in the shadow of his sincerity and passion about the art of drumming. He is also considered by many to be a trailblazer for fife & drum performers, opening up doors and creating opportunity for the next generation of rudimental drumming stars. Many are now following in his footsteps taking their drumming to stages never available before. in the world of drumming! the legend of the Dreaded Drummer proudly and every time he takes the stage there is a piece of both men with him. By day, Dominick Cuccia is an instrumental band director for the Paul Effman Music Service. By night he is recognized around the globe as the leader in “not-so-traditional” rudimental drumming. His drumming career began in 1976 with the Young Colonials Fife & Drum Corps in Lake Carmel, New York. He took individual lessons with Gary Gillotti and Mary Saunders utilizing the Sturtze method of drumming. During these early years with the corps he would also study with Jennifer Gougeon, Paul Moskowitz and Karen Muldoon. In 1981, at the age of 13, he had his first opportunity to teach the corps and by 1984 was running the entire drum line. In high school he was heavily influenced by his band director, Sam Ralabate and he studied percussion privately at The Music Lab with Jeffrey P. Funnell. Dominick received his Bachelors Degree in music education from Wilkes College (now University) where he studied with Robert A. Nowak and his Masters from Northwestern State University of Louisiana under the direction of Ken Green. His family tree of drumminghas ties to Les Parks, George Lawrence Stone and Earl Sturtze. Included among the influential teachers he has been fortunate to study with are rudimental great Nick Attanasio, jazz legend Joe Morello, and Hellcat alum Jerry Whitaker. Dominick has performed in some of the highest profile gigs in the genre. He is a veteran of the world famous Hellcats from West Point, New York (1991-1994). It was here that he marched in the footsteps of legends including Dennis Delucia, Harold Green and John S. Pratt as a featured soloist, composer and arranger for the band. Additionally, he was a cast member at Walt Disney World's Magic Kingdom, where he was leader of The Founders of Freedom Fife & Drum Corps. In 1999 he married Therese Rock, his drum corps sweetheart! Following in the footsteps of the rudimental legends who marched before him, Dominick has built a reputation as one of the "good guys" in the world of drumming. Known by many of his fans as the fife & drum guy, his knowledge as a teacher, musicality as a composer, power as a drummer and entertainment as a clinician, all sit in the shadow of his sincerity and passion about the art of drumming. He is also considered by many to be a trailblazer for fife & drum performers, opening up doors and creating opportunity for the next generation of rudimental drumming stars. Many are now following in his footsteps taking their drumming to stages never previously available. Dominick has shared the stage with a diverse group of musicians including Carmine Appice, Nick Attanasio, Steve Fidyk, Richie Garcia, Jamey Haddad, The Hellcats, the Hip Pickles, Aldo Mazza, NEXUS, The Old Guard, Steve Primatic, Bob Quaranta, J. Mark Reilly, Marcus Santos, John Wooton and The Cross Fade Percussion Duo. He is the author of The Beat of a Different Drummerand co-author of The Favorite Solos of Campbell, Cuccia & Pratt (both published by Meredith Music Publications). He is also the composer of the rudimental tribute to Steve Reich titled Contents are Flammable(quintet published by Bachovich Music). Additionally, he appears on two DVDs published by the Percussive Arts Society, recorded patriotic music for ESPN and recorded at the legendary Fame Recording Studio in Muscle Shoals, Alabama. Solos from The Beat of a Different Drummerhave been included in numerous winning auditions for The Old Guard, The Hellcats and contests around the globe. Dominick has performed in Canada, Germany & Switzerland, as well as across the United States. He has been featured as both a soloist and ensemble member at The Drum Boogie Festival, KoSA, The Grooversity Festival, The NYU/NYC Weekend of Percussion, The Boston LegaZy Drum Event (honoring Zildjean), PASIC, USARD Convention, the Yamaha Sounds of Summer and many Days of Percussion. Students who have studied with him come from diverse backgrounds. Jazz drummers, college professors, military musicians, concert percussionists, band directors, drum corps enthusiasts and more have made the pilgrimage to take lessons. Dominick is the leader of The Great American Fife & Drum Band, musical director of The Civil War Troopers, instructor of The Young Colonials and is an active teacher, clinician, composer and performer. 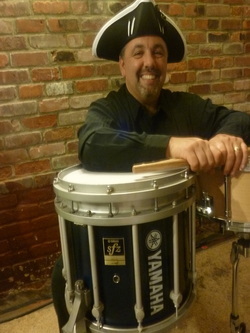 He endorses Cooperman Rope Drums, Innovative Percussion, Loyal Drums, Remo, Bachovich Music, Meredith Music Publications and is proud to be a Yamaha Performing Artist.